Officers with U.S. Immigration and Customs Enforcement and Homeland Security Investigations arrested more than 280 people at an Allen business Wednesday, ICE officials say. HSI officials told NBC 5 that a search warrant was executed at the business as part of an ongoing criminal worksite investigation. In a statement released Wednesday afternoon, ICE officials said the employees were unlawfully working in the US and were arrested on immigration violations. "As far as immigration related arrests, this is the largest ICE worksite operation at one site in the last 10 years," said Special Agent in Charge Katrina W. Berger, HSI Dallas. HSI said the investigation began after officials received multiple tips dating back about a year that the company, which repairs and refurbishes electronics used in telecommunications, may have knowingly hired people living in the country illegally and that many of the employees were using fraudulent identification documents. An audit undertaken in January of the company's I-9 forms indicated numerous hiring irregularities, officials said. From Texas Sky Ranger, ICE agents could be seen searching and handcuffing a number of people outside CVE Group on Enterprise Boulevard and placing them onto one of five large buses. "Businesses that knowingly hire illegal aliens create an unfair advantage over their competing businesses," said Berger. "In addition, they take jobs away from U.S. citizens and legal residents, and they create an atmosphere poised for exploiting their illegal workforce." Wednesday night, dozens of families impacted by the raid took advantage of legal advice offered by LULAC at United Methodist Church in Allen. Dora Hernandez said her daughter-in-law has worked at CVE for more than a decade. She was arrested when about 200 federal officers executed a search warrant at the business this morning. "[I'm] very sad because she is like a daughter to me," Hernandez said. "Some of these people have family members that have been working here for 10 and 15 years. So these are not people who have not just arrived. These are people who have been with this company for years, and have been in this country for years. It's sad because I understand that most of the people here are women and they are leaving behind their children," said Hilda Ramirez-Duarte, LULAC representative. "I talked to a young lady who is a teenager and she says, 'My mom is leaving myself, my brother, and two younger babies.' She's the only breadwinner in the household, so what's going to become of this family of four? We have similar situations all across the board." The raid sparked protests in Allen and Dallas, where about a dozen people chanted and held signs outside an ICE field office. "These are hardworking people. These are not criminals, rapists, or anything of that nature. They are hardworking people earning a living," Ramirez-Duarte said. In Garland, Wendy Armas arrived home after spending hours in ICE custody. Armas, a Guatemalan national with two teenaged children, said she's worked at CVE since arriving in the U.S. five years ago. She was arrested, but released Wednesday night after making a promise to appear in court in May. "The hardest thing was when the bus started taking off. 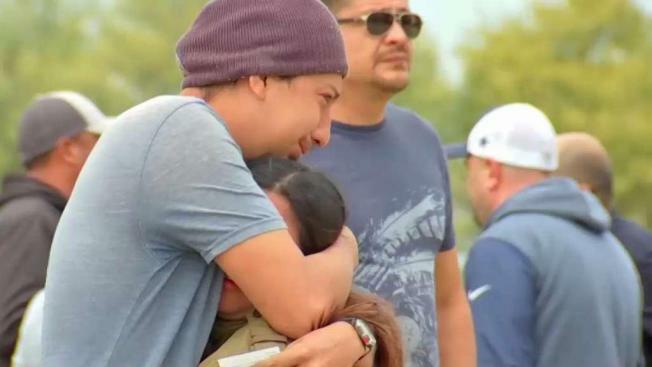 It reversed out and then there was a long moment of silence, people crying, people saying, 'I'm going to leave this country and go back to my own,'" Armas said. HSI said all of those arrested and detained Wednesday were interviewed by ICE staff to determine if they remain in custody or considered for humanitarian release. In all cases, HSI said, all people living in the country illegally will be fingerprinted and processed for removal from the United States. Consulates for Mexico, Honduras, and El Salvador, as well as ICE, have set up numbers for people to call if they believe their family member was arrested. A 24-hour toll-free detainee locator hotline is available for family members of those arrested. The hotline is designed to answer questions, in both English and Spanish, about those detained, their location and status. That number is 1-888-351-4024. NBC 5's Courtney Gilmore contributed to this report.